You cannot call your music set up the best unless you have some decent floor standing speakers. Floor standing speakers are one of the most popular speaker types of all time; there is no doubt that they are the heart- pumping anchor of any great home theatre system. The speakers’ general design also offers one a unique opportunity to fit more of them into a small living space. There are several brands of these speakers in the market today. A good number are of high quality and are constructed for crisp clear sound to spice your living space. Most are also elegant and sleek to perfectly fit into your home décor. 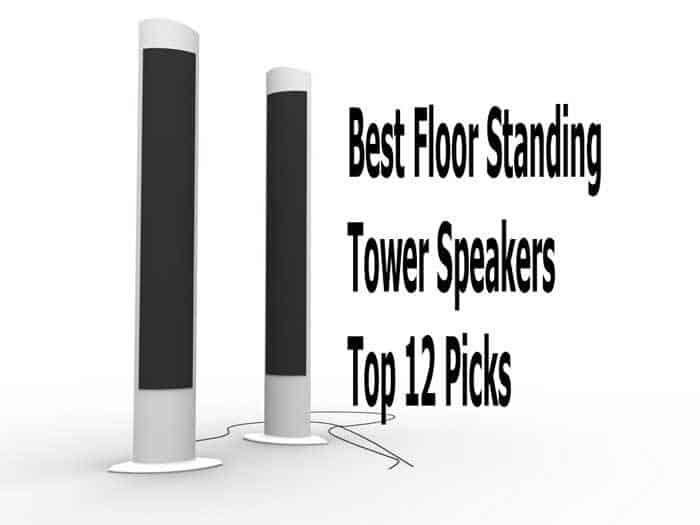 Our experts tested several floor standing speakers just to select the best for your buy. Each speaker in this list is durable and will give you the listening experience you have been longing for. The speakers are purely ranked after hours of considering their sound quality, design and price. That’s how we ended up with our top 10 performing shower speakers as we will see below in our comprehensive review. Klipsch has been around for decades, improving its designs to create loudspeakers that will blow your mind off. Their new premiere series is built on acoustics and improved technologies to provide and deliver an intense listening experience. Enhanced tweeters: The speaker’s newly designed tractrix horn features a circular throat around an advanced titanium diaphragm tweeter to further improve high-frequency response and deliver quality sound to your listening space. Each RP-280F boasts a dual 8-inch woofer to give you a tremendous bass and warm clear mids. The 1-inch horn tweeter delivers crisp extend highs for that perfect listening experience. High frequency response: With an impedance of 8ohms and a sensitivity of 98dB, the highs and midranges will feel clean and detailed. The speaker has a good frequency of 32-25kHz and a power handling of up to 600 watts peak which is sufficient for your day to day listening. Quality sound: This Klipsch RP 280 F features flared openings in the speaker's cabinet project sound waves towards your listening space and prevents them from spilling out in different directions. This design also reduces reflections that colour the sound and improves dynamics to achieve crystal- clear sound at all volume levels. The speaker’s compressed moulded rubber construction adds high-frequency damping to reduce the harshness and improve sound detail. This, in the end, gives you the cleanest and most natural sound that will not fatigue you as the listener. To give you the cleanest sound that there is, this Klipsch RP 280F features an MDF cabinet with brushed polymer veneer baffle finish. This feature also gives your speaker a lavish aesthetic finish and an absolute durability. Durable construction and design: The ceremetallic woofer’s design maintains exceptionally rigid and lightweight construction for minimal cone breakup and distortion.The speaker's grille is detachable at your convenience, it attaches magnetically for an elegant transition whenever you please.Its sleek design will perfectly fit into your home décor. Our Verdict: Overall Klipsch RP 280F will pull off a performance that will leave your jaws dropping a few times. It is one of the most dynamic and impactful floor standing speakers on the market today. This speaker will take your listening experience to new heights, which is why we highly recommend it. The Samsung TW-J5500 delivers phenomenally great sound performance. The speaker is enriched with a dynamic rich sound that will truly bring a cinematic experience to your living space. Designed for serious music lovers: The speaker features 1-inch dome tweeter designed to produce clear highs and lows. The tweeters bring out the authenticity in music without skipping even a single note. Efficient sound production: The impedance rating on the Samsung J5500 is 1ohm which means that may not be able to handle some power configurations. It can however handle power input up to 350W. This Samsung stereo will work well with range frequencies of as low as 36HZ to as high as 20000Hz. The speaker deliver high-quality audio through its 2.2 channel audio with the horn tweeters and ported woofers that produce clear, deep and accurate bass for an intense listening experience. The sound quality of this stereo is incredible with crisp highs, highly detailed midranges and decent bass response. The integrated mid-bass woofer in the speaker produces a great bass response that is hard, giving your music that extra kick that you desire. It features Bluetooth connectivity which enables you to connect to other sources like your smartphone to enable you stream digital music as much as you wish. It also allows you to hook up a USB drive with your favourite music in order to enjoy music directly from your drive or any other USB listening source. The television sound connect feature allows you to connect all non-wireless music sources to the speaker through the HDMI cable that is included in the box. With this component, you will instantly enjoy clearer and impactful sound while watching your movies or listening to music. High durability: The speaker’s high-quality cabinets help in reducing sound resonance and vibrations. The speakers it firmly without moving any bit when playing your music.You will find a remote control and batteries in the box to start you off.The Samsung TW-J5500 has an elegant sleek design that blends in perfectly into your home décor. Excellent compatibility: The binding post for the speaker is designed for banana plug connectors making it compatible with all standard speaker wires. May not compare to other floor speakers in the same category even though it has incredible features to keep it on our list. Our Verdict: Samsung TW-J5500 is modern tower speaker because it fills the void of a 5.1 channel home theatre system with a Bluetooth floor-standing tower speaker set up. The Polk Audio T50S are beautifully crafted standing floor speakers that you will thoroughly enjoy listening to. The speakers feature quality construction and high-end acoustics. Excellent quality base: Their 1-inch silk dome dynamic balance waveguide tweeter provides a transparent crystal clear treble. The 6.5'' extended throw composite dynamic balance drivers provide open, uncoloured midrange and punchy bass that will take your listening experience to new heights. Impressive frequency rate: The impedance rating on the speakers is 6ohms. The speakers have an impressive frequency response of 38Hz to 24000Hz and a peak power handling of 150W which is great for your everyday listening. Enhanced sound quality: The speakers provide a very clear crisp sound which is appealing to listen to all day long.These T50s produce clean sound from both tweeters and bass radiators, the sound is clear without a subwoofer. Even though some may need a subwoofer to achieve a full sound range, the T50s produce a sound range that is quite satisfactory. They highly strike a great balance between full sound and the floor thumping sound. They also create an enhanced soundstage when paired with other speakers. Heavy duty design: These Polk- audio speakers are well –built, classic and highly stable. They are designed in a tower style and are waist high.They have a nice black wood grain finish that easily blends with your home décor. They come in a sleek black oak finish. The MDF lining enables the speakers to hone and project the sound forward. The design is further enhanced by the grill that is easily removable each time you will want to reveal the stylish speaker. Their design is highly compatible with most home theatres Av receivers. You will immediately notice a powerful sound output the moment they have been hooked up. Connect to multiple sources: The Polk audio T50 speakers have a standard banana plug terminals that will support and connect to any standard speaker wires. The speakers have bi-amped wire which provides enough power to each component within the stereos. Our Verdict: Generally, the Polk Audio T50s are some of the best floor speakers in the market today. There is no doubt that these speakers will give you value for your money. Sony SSCS3 is a great option if you happen to be a serious audiophile. This is a speaker that works perfectly in a mid-size or small room; it still manages to deliver great sound quality in a larger room. Enhanced bass audio: The speaker is equipped with a ¾ Sony super tweeter for immersive and quality sound output. The mica reinforced drivers are designed to deliver high-quality sound performance, with the bottom layer of the diaphragm delivering an enhanced bass response. The speaker’s twin 5.25 inch woofers are made of long-lasting materials for excellent performance. They have a pleasant bass response that takes care of the lower range and midrange audio. The speaker's frequency response of 45Hz to 50000Hz makes it broadest frequency range for any tower speaker in our list. The peak power output for this speaker is 145 watts. It produces an excellent audio quality when paired with a decent speaker. The frequency range on the speaker is much lower which initiates a better low-end response. The sound quality from this speaker is great, with detailed midranges and crisp highs. The amount of bass is also adequate. The 3- way, 4 speaker design of the speaker works perfectly well with the integrated cross over to create unique sound effects. It will complement your home theatre setup and will also work well as a stand-alone channel speaker. The vocal performance sounds natural and you can easily pick up details in the music. The crossover design on the speaker is highly efficient and comes with micro reinforced drivers that produce high-end sound. To get the best depth and soundstage, the acoustic drivers require some strategic positioning.There is no doubt that live concert recording will sound more detailed and well defined with the Sony SSCS3 speaker. Built to last longer: The speaker looks classic and sleek when placed on the floor.It comes with an elegant cover over the acoustic drivers. The cabinet designs are durable and solid they rest well on the surface which prevents the speakers from vibrating when the volume is turned up. Our Verdict: The Sony SSCS3 is for you if you are looking for a high performing speaker on a good budget. The ELAC Uni-fi UF5 floor standing speaker is incredible when it comes to delivering high quality sound. The speaker is for those who are looking for a long term audio solution. Incredible bass audio: The midrange unit of the speaker consists of 1 –inch soft dome tweeter housed concentrically within a 4-inch aluminium midrange driver. As a result of this, the speaker has an excellent tonal balance. The bass, midrange and treble are extremely well matched. There are three 5.25 inch aluminium woofers that are responsible for the low levels of distortion over the working frequency ranges of the drivers. The aluminium material is also a perfect choice for construction thanks to its lightweight and stiffness. Unmatched sound quality: The UF5 has a lower than average impedance of 4 ohms and a sensitivity of 85dB, meaning that this speaker will sound at its best with high-quality powerful amplifiers and receivers. It provides an effective frequency range of 42-25000 kHz; its maximum recommended power is 140 W per channel. The speaker's cabinets are made of black vinyl-clad thick MDF fibreboard with an ample internal bracing and are triple ported in the rear. It sits on a pair of outriggers that are screwed tightly on its base. The outriggers have spikes inserted into them so that the speaker remains firmly held on the floor even though the thick carpet. The sound quality of this UF5 speaker is superb and great for a simple stereo set up for multi-speaker set up, making it an ideal addition to your home entertainment system as a front right and left channels. The speaker sounds incredible when added to a decent amplifier. You will love the smooth and lush-like synthesizers with a strong presence. This stereo reproduces vocals nicely and blends smoothly with the instruments. Durable construction: It has three rear ports with very high-quality metal five-way binding posts. The finish and construction of the speaker handle a banana locking terminations with much ease. ​​​​The speaker's cabinets are made of black vinyl-clad thick MDF fibreboard with an ample internal bracing and are triple ported in the rear. It sits on a pair of outriggers that are screwed tightly on its base. The outriggers have spikes inserted into them so that the speaker remains firmly held on the floor even though the thick carpet.The speaker will look great in your home, thanks to its elegant design. Built for compatibility: It has three rear ports with very high-quality metal five-way binding posts. The finish and construction of the speaker handle a banana locking terminations with much ease.The speaker has a bi-amped 5 way wire for increased conductivity. The low nominal impedance and relatively low sensitivity may be a concern. Our Verdict: The ELAC Uni-FI UF5 is hands down the best, clearest speaker for your money. It is the speaker for any aspiring audiophile needs to own for many years to come. Listening to it will make anyone feel emerged after a while. The Pioneer Company is undoubtedly reliable not mentioning its outstanding products of over 70 years. This floor standing speaker is made with great features for convenience and maximum performance. Designed for serious audiophiles: The speaker has a single soft polymer tweeter with a radius of 1-inch that takes care of the audio even at high volumes to ensure that you have a clear sound at all times. Excellent frequency response: The speaker has a maximum power output of 300 watts and impedance rating of 6 ohms this. You will need to choose a decent amplifier for the speaker when need arises. The speaker’s frequency response of 44Hz to 30Hz will incredibly change your listening experience; the vocals will be detailed and sweet like never before. Its sensitivity rating of 87dB enables the speaker to consume more power. Does not distort: The speaker is capable of eliminating much of digital harshness thanks to its highs that are extra smooth. You will fall in love with it if you are looking for nice musical speaker with excellent details. ​​​​The pioneer SP-FS52 is 35 inches tall and has a cabinet design to expand your listening experience and reduce internal waves into the system. The speaker has a lot of basses which is pretty good. The bass is crisp and impactful which makes the surrounding one of a kind. The speaker can effortlessly fill a larger room with sound and can be loud if need be. Long-lasting construction and design: It comes with an elegant grill that looks very appealing; you can easily remove it when you want the drivers exposed. The base is also removable to enable you to engage in a variety of positions. The speaker is probably going to last for a long time because of their high resistance to accidents. It will look great in your home thanks to their design and colour which blends perfectly with any home decor. Our Verdict: The speaker meets exceptionally to its price and power demands as expected. It is an affordable speaker with matching quality and effectiveness. It is a great value for your money. This is a great all-in-one speaker set which is convenient, if you do not want to get the additional subwoofer to your entertainment system. The Onkyo SKF-4800 speakers produce natural quality sound across the audio spectrum. The speakers are one of the best on the market that are engineered to bring energy and full- spectrum power to the entertainment system. Consistent sound output: The 1-inch dome tweeter in these floor speakers delivers high-frequency vocals. The tweeter driver is designed perfectly to cover part of the mid-range frequency for better sound quality. The two 6.4-inch cone woofers have an inbuilt equalizer to deliver produce sweet and detailed bass. There is consistence sound the equalizer puts together the audio output from the woofers and the tweeters. Pleasant frequency and sensitivity rating: The frequency response of 55 to 35000Hz on these speakers is quite good for serious listeners. They also have a maximum output of 130W which is way better than most speakers in their category. With this amount of power output, the speakers do very well in terms of sound quality while the impedance of 6 ohms demands that you get yourself a powerful amplifier but only when need arises. The speakers' have a sensitivity rating of 86dB and are efficient when it comes to power consumption. The sound produced is detailed and clear even at high volumes. The treble is long-lasting and piercing. The mids sound soft and are excellently detailed. The bass, on the other hand, has a steady tone, that is not booming. These speakers can be used to complement a stereo system or build up a surround system by using them as left and right channel speakers. ​​​​Enhanced durability: The Onkyo speakers are tall and heavy. They are equally heavy but most of the weight is due to the wood comprising of the cabinet casing. The outer side of the speaker comprises of wood with a black semi-gloss appearance that remains smooth on touch even after several years of use. They look absolutely elegant when set up, and will also blend well with your home décor. Playfrom multiple sources: To ensure that each driver receives utmost power, the speakers are bi-amped. The speaker is banana plug compatible that will support the regular speaker wire. Our Verdict: Even though the Onkyos SKF-4800s speakers are quite expensive, you really get what you pay for.You will get speakers of great quality more than what the competition can offer. JBL Arena 180 is an affordable tower loudspeaker that has an ability to sound off your MP3s, video streaming and music videos with its orchestral excellence and modern computer optimized tech. Incredible high and low volume: The JBL-Arena 180 floor standing speaker features a 1'' soft dome tweeter that helps deliver those clean and powerful highs you desire. The two 7 inch high output polycellullose woofers operate in conjunction with a rear-firing tuned bass port delivering a high-quality sound that you would want to listen to all day long. The speaker’s realistic sound effects make watching movies and listening to music great. The speakers deliver sufficient volume across the room effortlessly. The midrange sound is consistent and utterly defined. The bass effect is also out of this world, you will always get that punch to music because of the speaker’s great sonic impact. Excellent sensitivity: With a frequency of 39 kHz-40 kHz, this JBL speaker produces a full range of sound, from deep bass to very high frequencies. The speaker is crisp with an impactful sounding, that you will instantly fall in love with.The speaker has a sensitivity of 86db and an impedance of 8ohms. Your listening experience will never be the same, thanks to the speakers maximum power output of 200 watts. Listen to unmatched audio quality: The speaker’s realistic sound effects make watching movies and listening to music great. The speakers deliver sufficient volume across the room effortlessly.The midrange sound is consistent and utterly defined. The bass effect is also out of this world, you will always get that punch to music because of the speaker’s incredible sonic impact. Increased durability: It has a space saving design that offers you maximum flexibility. Additionally, the speaker can be integrated with other speakers in your home entertainment set up.The speaker is beautifully designed and looks elegant from the front angle; it also blends easily with your style. Dynamic terminal type and wiring: The speaker is designed to use a 5-way bi-wiring in order for long-lasting effect. The terminal type is binding post that will work well with any banana plugs and regular speaker wires. Our Verdict: The JBL arena 180 is a high quality, tight sounding speaker that sound more expensive than it actually is. For the best quality, this is the speaker you can get at a good price. The Fluance XL7F floor speakers are unique in their design and incredible performance. They will definitely offer you more than you what bargained for. One of the loudest speakers on our list: The speakers have a high –quality tweeter and a powerful driver for delivering flawless sound output the 1-inch high quality premium neodymium silk to ensure that high notes are not skipped during your listening. They also have two midrange drivers of 6.5 inch each. The drivers handle most of the sound playback because they handle the most vital frequency of about 200Hz to 2000Hz. The speakers have an impedance rating of 8ohms. With this impedance rating, the speakers will work well power input up to 200 watts.They also have a high sensitivity rating of 89db which is great when it comes toreducing power consumption when music in high volume is played. High quality sound: The speakers are capable of playing music in high volumes without any distortion. The bass is hard with low end responses that will make listening a great experience. They also produce natural sound; this means that you will get more than you bargained for. You may choose to get a decent subwoofer for this speaker if you so wish. Durable design: The speakers are a 3-way tower that relies on the tweeter to generate high-frequency sounds. The speaker has an inbuilt subwoofer to minimize bass distortion and utmost audio clarity. The woofer is 8inch tall that emits sound directly from the floor surface for added effect. These Fluance speakers are made of a density fibreboard wood to enable reduced resonance audio distortion. The mahogany classic finish gives these speakers an appealing look that perfectly fits into any room décor. They are relatively lightweight and can be easily moved when need be. Excellent terminal type and wiring: The speakers are bi-amped, with a 5-way wire made of gold plate for utmost conductivity. The binding post are made for banana plug connectors and will work well with most standard speakers in the market today. The mahogany classic finish gives these speakers an appealing look that perfectly fits into any room décor. They are relatively lightweight and can be easily moved when need be. Frequency range response is limited. Our Verdict: We recommend the speakers if you are looking for a little more character and flavour to your sound, there is almost nothing better at the same price range. The Yamaha NS-F210BL 2 way bass reflex speaker is one of the best floor standing speakers on the market today considering its price range. The speaker was designed to deliver the dynamic sound of HD sources. Impressive audio performance: You will love the crisp highs and clear lows delivered by the speakers.The speakers produce natural appealing quality sound that fills the entire living space. The vocals are clearly defined; we bet you will never get enough of the sweet sound coming from the speakers. It has a sensitivity of 86dB and a frequency response of 50Hz -45kHz with an excellent power output of 120 watts peak handling. Quality construction: This speaker has a slim design that will match with a lot of flat panel TVs, this also means that you will be able to set them anywhere without the worry of them looking out of space in your living area. This speaker comes with an additional gauge wire for connections and a detachable front grille. The speaker is extremely lightweight thanks to its aluminium cone woofer. Irrespective of this, it still maintains the stiffness that you need so that you have a woofer diaphragm that delivers a high-speed cone movement. This speaker looks modern and thanks to its ergonomic design, the undersized drivers are squeezed in order to offer you something lean and space friendly. The terminals on this speaker are banana plug compatible with binding posts. The wiring is bi-amped to deliver maximum power to the drivers for quality sound. Our Verdict: With the Yamaha NS-F210BL 2 way bass reflex floor standing speaker, you will not have issues with sound quality since you shall be able to hear audios in full high quality. Luckily enough, all your HD sources will no longer be tainted by poor listening experience. Cerwin-Vega XLS-28 is for you if you are looking for a floor stereo that is incredible in sound quality but costs much less. There are several Cerwin Vega speakers on the market; you will definitely find a perfect speaker for you depending on the size of your room. Built for excellent sound delivery: The speaker features a 1-inch tweeter with ferro- fluid and a three way design of 8-inch woofers.The woofers have a 5.5 inch midrange driver to deliver clear lows and crisp highs.This speaker will produce accurate bass tones. The bass will be dominant and hard-hitting without taking away other ranges in the track. Efficient frequency response: The speaker carries an impedance of 6 ohms meaning that it is less resistant to power than many speakers in the market. It is wise to check if your amplifier can handle such an impedance to avoid damage. The speaker has a sensitivity of 89dB; it will perform well and last longer because of this kind of rating. The speaker has a peak power capacity of 500 W. Its frequency response of 2400Hz to 280Hz will provide you with clear and detailed vocals you deserve. Will last years to come: You will love the speaker’s elegant black-ash closure. It will definitely blend with your home décor effortlessly. The speaker comes with detachable grilles, to enable you to match your decor at any given time. Enjoy listening from multiple sources: The terminals on this speaker are banana plug compatible with standard speaker wires for your convenience use. Our verdict: The Cerwin –Vega XLS-28 is one of the best floor standing speakers in the market today. If you are looking for a high-performing floor speaker, we believe that this one is worth the investment. The Rockville TM 150W is not only elegant in design but also excellent when it comes to delivering the sound quality you would love to listen to. Believe it or not, this stereo has everything built in. Powerful and loud speaker: Each tower speaker has an inbuilt tweeter and 4 fullrange drivers with polypropylene cones rubber surrounds and bullet cup dust to increase performance and durability. The 2 silk dome tweeters produce incredible highs at all times. Each driver features a frequency specific independent amplifier. The amplifiers can be controlled from the remote or the front panel. The speaker has a peak power of 1000 watts and RMS power of 250 watts. It also has an impedance rating of 8 ohms making it a real deal for serious audiophiles. The frequency response of the speaker is 18 to 27000Hz. The speaker is able to find balance between power efficiency and sound precision thanks to its sensitivity of 90dB. This home theatre sounds as good as it looks. The bass is clear and loud. Adjust sound and volume accordingly: The speaker’s inbuilt 8 band equalizer enables you tune to the sound of your preference. The inbuilt high and lows pass crossovers highly increases the stereos performance. The speakers allow you to connect to your television through the RCA inputs or via the optical input. It has an AUX function and a Bluetooth to enable you listen to your music from any source. Optimum long-lasting construction: The speaker is made with top quality MDF wood and chrome speaker ring accents. Together with the modern LCD glass display, the speaker looks decent and beautiful. The remote is also stylish and will help control every function of the home theatre. The modern sliver plates surrounding each other on the front panel gives this speaker a stylish finish. Optimum long-lasting construction: The speaker is made with top quality MDF wood and chrome speaker ring accents. Together with themodern LCD glass display, the speaker looks decent and beautiful. The remote is also stylish and will help control every function of the home theatre.The modern sliver plates surrounding each other on the front panel gives this speaker a stylish finish. Our verdict: There is no doubt that the Rockville TM 150W home theatre has a kicking and energizing sound with detailed clear highs and massive basses. You will enjoy music differently. This is why we highly recommend this home theatre, we believe it will not disappoint one bit. Look for a set of speakers that are big enough to fill your music room. There are several types of compact speakers that will not take a lot of space on the floor. Just look for a speaker or speakers that will fit perfectly in your living space. Do not think that the smaller speakers are better; remember that bigger speakers are generally louder than the smaller ones that tend to occupy less space. It is important to consider your preference and location before you decide which size of speakers you want to purchase. There are plenty of speakers that are durable and strong. It is important to look into how compact the speakers are rather than being particular about just getting new speakers. You don't need speakers that are going to fail you randomly. Impedance is all about restricting the flow of an electric current through a speaker. The rating is done with ohms rating on speakers. For example, an 8 ohms rating will meet your listening expectations. A speaker with an impedance of 4 ohms that needs to be paired with a high power amplifier to achieve best audio results. The sensitivity rating of a speaker defines how well the speaker converts power into volume. The higher it is, the louder the speaker when played at a specific amount of power. In short, the speakers that are more sensitive consume less power. This is usually a measure of how much of the 20 to 2000Hz range the speaker can produce. The speakers with high frequency response have a wider range, its highs and lows are likely to be clear and detailed. It is important to be keen on the wiring on the tower speaker you wish to buy. You will notice that there are some speakers with set of wire terminals while others have terminals with crossovers. The Bi-amped speakers have two separate sets of cables that connect them to the amplifier. Each cable then carries a signal from a separate amplifier. The Bi-wired speakers have two sets of cables that connect to the speakers with a single output connector to the amplifier. The bi-wiring does not provide the same amount of power to the speakers the way bi-amping does. Even though there is no much difference between the two types of wiring, it will depend with your preference as to which type of wiring you will want on your floor speakers. Spring clip terminals are found in cheap speakers that work best with pin-type connectors or small gauge speaker wire. They are the most versatile type of terminals found on expensive speakers in the market. These post terminals are threaded to ensure that they tighten the wires when connected. Look for speakers with a classic design that will look good in your home. Most speakers on the market today are designed to appeal to listeners who are great admirers of vintage finishing. We know that finding compact and quality floor standing speakers is quite a challenge. Knowing what you are looking for is a number one step towards finding the right speaker which will last you for many years. There are several speakers with good design at an affordable price. Do not rush, just take your time! You will ultimately get the speaker that you deserve.